These are pictures of a liner and new cutting edge installed in a Caterpillar 988 bucket. These are pictures of a blade repair on a local mining company's D11 dozer. The side of the blade mount was cracked. It was grooved out using air carbon arc gouging then rewelded. To support the weak area, 2 horseshoe-shaped reinforcing bars were welded under the the region that broke. 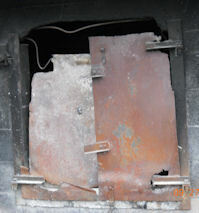 These are before and after pictures of doors for a local engineering company's incinerator. These are pictures of new, stronger equipment trailer ramps and their conversion from manual to hydraulic operation. These are pictures of a handrail installed at a retirement home. The residents needed a railing in order to safely negotiate the driveway, which is fairly steep. The vertical posts needed to be set back from the pavement, and a "dogleg" needed to be installed to allow for the curb at the top of the driveway.